The LumiQuest Soft Screen Diffuser is designed to soften the light output of the built-in pop-up flash of many SLR cameras. Note: Not compatible with Minolta cameras. Box Dimensions (LxWxH) 5.4 x 5.2 x 4.6"
Soft Screen Diffuser is rated 3.9 out of 5 by 120. Rated 5 out of 5 by Annie Leibovitz Wanna-Be from Pleasantly Surprised Used this product at a wedding shoot. Couldn't afford to buy an external flash at this time. Found this product to be a very satisfactory substitution, not to mention a super affordable price. As the product explanation stated, it, indeed, does soften the harsh lighting created by the camera flash if used within 6 feet or less of subject. Found it very useful when used during posed shots of subject/subjects. When taking candid shots at various distances, it just took too much time mounting it and removing it as the shot distances required. However, if used as manufacturer suggests, I was very pleased with the results. Great product. Rated 2 out of 5 by Anonymous from Great Idea, bad execution for Canon I really want this thing to work. And it does. The problem is with the way it mounts to the camera. For Canon owners, you have to cut away the tabs that slide into your flash shoe. 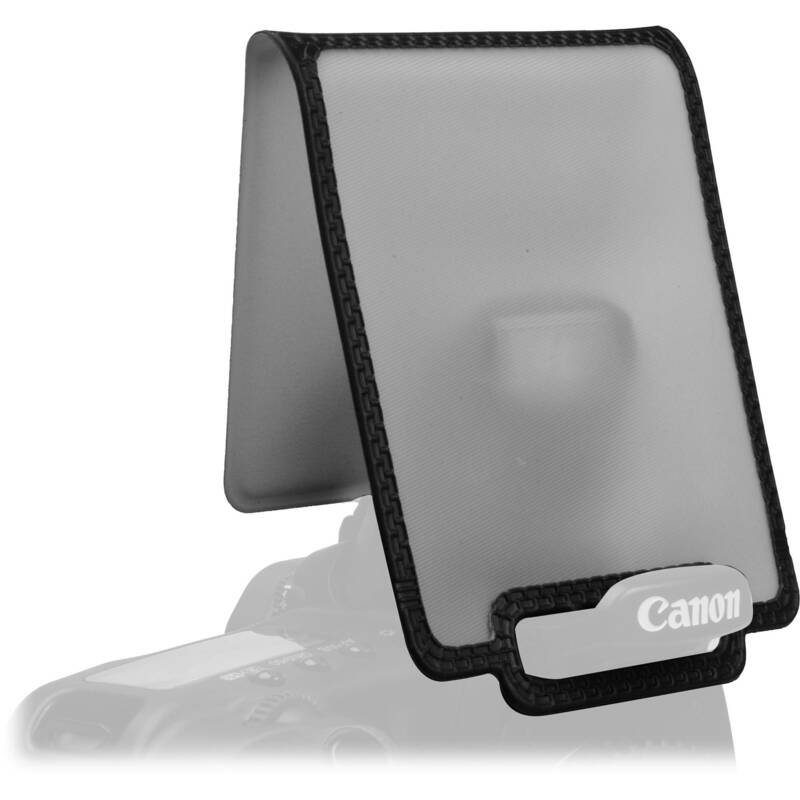 If you don't, the mount tab activates a micro-switch in the flash shoe and your flash won't work. Once you cut the tab out, it won't stay mounted in the shoe. Well, it will stay there but it is really flimsy. And, if you want to use it on two different cameras and, as is in my case, the micro-switches are on opposite sides, you'll have to cut away both tabs, then it won't stay on the camera at all. Don't waste you money if you are a Canon owner. Rated 1 out of 5 by Amy from Don't use for extended shoots Used this at an event shoot where I was taking lots of flash photos and the diffuser MELTED the plastic cover of my on-camera flash! Local camera store says I will need to send off my camera back to Nikon to have it fixed and that it will be $$$. Clearly, something like this wouldn't be covered under warranty, so I can no longer use my on-camera flash. Before the melting incident, it did work fairly well to cut down on the harshness. But I would not recommend this product to anyone, given what happened to me. Rated 4 out of 5 by Anonymous from Handy little piece of gear for your bag. Although it is advertised for Canon cameras, it can be used with others that have hot shoes. I trimmed mine down to fit my Nikon and it worked well. One of the down sides is that the front of the screen may not stay in place. And if you are an active shooter, you will want to check it periodically. It does have a piece of velcro you can use to solve this problem. I just don't feel that it will hold up to the attaching and unattaching if you are on the go. It does give a soft feel to an on camera flash. You may need to adjust your flash intensity up a stop or so for anything beyond 6 feet. All in all, for the money, it's a handy little piece of gear for your bag. Rated 5 out of 5 by Anonymous from Good portable Diffuser I bought this diffuser because I wanted to soften the faces of my subjects without having to carry around bulky equipment. I tested it to see if and how well it worked. So I took a picture of my subject with my camera's built-in flash and another one with the diffuser in front of it. The results were very noticeable. With the diffuser, the skin showed a more true natural look with a touch of tan as opposed to the one taken without it. Without the diffuser, the skin looked a bit washed-out and more pale. The only con about the diffuser is that the square loop on the diffuser doesn't stay put when I wrap it around the front border of the flash (where the camera logo is). But for me, it's not much of a big deal. It still gets the job done. Rated 4 out of 5 by my name is not jullian from Does what supposed to, but marginally For the price, it does a good job of diffusing my pop-up flash. It kept making my Canon think there was a flash attached to the shoe, disabling the flash, so I followed the instructions and removed a small portion of the plastic flap you insert into the shoe. The problem is its already flimsy to start, and now it flops around a lot more and is much harder to feed into the shoe. Not too big of a problem. The results are good though, definitely better than a direct flash, but not as good as using a speedlite. If I were to buy again, I'd probably go with the Gary Fong or Sto-Fen though. Rated 4 out of 5 by Douglas L. from Works well,but needs better design This is a nice little item that I use with my pop up flash when I don't want to lug around a full size flash. It is great for fill flash and weighs about nothing. It folds flat and tucks away easily.I use it on a Canon 40D.Its biggest downfall is that on Canon Cameras the solid mounting tab that slides in the hot shoe must be trimmed to expose the sensor that keeps the flash from popping up.This weakens the tab and makes much harder to insert in the hotshoe.I fear it will become useless after awhile. Perhaps they can make the Canon version with a clear tab.Other than that it is a inexpensive, useful little tool. How does this compare to the Gary Fong diffuser also made for the pop up flash? This LumiQuest Soft Screen Diffuser for Camera with Pop-Up Flash is smaller, easier to pack, with higher contrast, than the Gary Fong Puffer Plus Flash Diffuser. Does this unit fit properly if attached to a Nikon D3000, D90, or D7000? Due to the status of this product as Special Order we are unfortunately unable to answer this question. We suggest you reach out to the manufacturer. is this compatible with a fujifilm hs50exr? are any other pop-up diffusers that you carry compatible with that camera? Could you use this in place of a 'Dome Diffuser'?? Thank You!!! Asked by: Sgt. Salvador M.
Does it work for Sony 6000? This is not compatible with the Sony a6000. Take a look at: B&amp;H # 3DNESTMICRO. Will this eliminate Red Eye ?? Thank You!!! do you need hot shoe for this? It works on a hot shoe on my Nikon. I also use it on my Nikon SB-800 external flash by placing it over the light and holding it in place with rubberbands, no hot shoe needed. Do you post to Malta, and how much all inclusive would it be? Yes, we do ship to Malta.You may calculate your actual shipping options/order totals by adding the items you want to a shopping cart. It will then list the shipping options, descriptions, ETA's and fees to your location.